I just spent the last few days out of town. I love to travel, but mostly when I travel, I travel out of the country, but this time it was only to a different state. Nothing exciting, just 3 hours away from my home. But this trip seemed at times to be a thousands miles way. Not sure why, but I think it was because I had a lot on my mind, and in a way I was thousands of miles away, not from home but from…. What I am not sure, it was/is just a feeling, and small feeling that seems to rest just on the inside of the door to my soul. The small feeling, the one that is just on the inside of my soul most likely has been their for sometime. But the three hour car ride gave me time to reflect, time to open the door to my soul and seeing that small feeling just sitting there, waiting for me to open the door and find it. And I did, I found this small feeling, it was just sitting there, like it had been waiting for months and years to be found. It wasn’t a new feeling, one that I have never had, rather it was an old feeling, one that I have walked around and stepped over for year and years. The dust and cobwebs that covered it were thick with pride. A pride that I have known for years, a pride that was and is eating away at this small feeling that was just on the inside of the door to my soul. Pride, one of the seven capitol sins, and in many ways the root of all sin. It was pride that made Eve take that first bite, and pride that made Adam follow her in to sin. 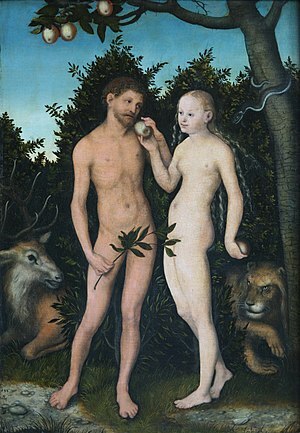 The proof of this, after they ate the fruit of the tree, they discovered they were naked. Their pride took over and they were now, for the first time, concerned at how they looked. Adam and Eve are the parents of pride, parents of the first sin. Pride has kept me from seeing this small feeling just on the inside of the door to my soul, it cover it in a thick dust that hid it from my eyes, but that is what pride does, it hides the truth from you. We see this is our lives all the time, just like pride hid from Adam and Eve the beauty of their creation, pride has hidden from me this small feeling. But the three hour drive gave me an insight, it gave me time to start to blow the dust and cobwebs off this small feeling, the one that was just on the inside of the door to my soul. I used the total of six hours to listen to some solidly Catholic talks on CD. Just before I left for my trip I selected a few talks on CD for my ride, you see I belong to the CD of the month club offered by Lighthouse media, a Catholic non-for-profit company that produces and distributes Catholic talks, and each month I get a new CD in the mail. Normally I would have listen to them as soon as I got them, but for the longest time I did not have a CD player in my car, and trying to listen to them at home, well lets just say that don’t work out to well. So I have a few un-listened to CD’s sitting around, so I gathered them up and placed them in my car. A few days before I was to take this trip I decided I would break down and get a new stereo put in my car, one with a CD player. I just couldn’t deal with the drive with out some music or talk radio or something to help keep me company along the way. So with my talks on CD and a few select music CD’s I was ready for my trip. The funning thing is, I listened to only the talks, the the talks, well, they were perfect, I listened to all the talks I had, and when I pulled in the drive way at home, the last CD was played and I was listening to my Liberal CD. The timing was almost perfect, and it would have been if it were not for construction on the expressway. God is good, He is good indeed! The fact that the timing was almost perfect was not accident, it was divine. Not only did the talks last as long as my drive time, but in a way each talk was talking about me, each talk was sending me, personally, a message. The titles of each talk were different, and the presenters were diverse, from priest to converts to new seminarians’. But each talk was just perfect for what I needed to hear. Each talk was given to me personally, it was like they wrote the talk just for me and just for this car ride. The talks all had the same basic theme to them, pride and how pride is evil and how it tears you away from God and the life of perfection, how pride can and is slowly killing you, Non of the talks came out and said this, but this is what i heard. And more importantly it is what I needed to hear. That small feeling, the one that is just on the inside of the door to my soul. The one I have been steeping over and moving around for years, that small feeling was dying, it was being eaten away by pride and if I didn’t do something soon it would be dead and nothing short of a miracle would bring it back to life. And the talks on the CD’s, well in a way they were the voice of God speaking to me and God was telling me “It is time to dust off the small feeling and to let it see the light of the I AM, to see the light of God”. What a powerful message, one that will require a powerful conversion on my part. And one that I am not sure I am up to, but I will trust in the Lord and I will start to dust it off and see what lies under all the dust and cobwebs of pride. I will start the process of cleaning out my soul, to open the door up and let the wind of the Holy Spirit refresh and cleans my soul. I will allow the light of God to fill it, to illuminate it and to fill it with the warmth of Gods love. I will clear the way, and make a path for Jesus to enter in to my soul and to dwell there in a welcoming and comfortable environment. So what is this small feeling, what is covered up with the dust and cobwebs of pride, it is forgiveness. And how do I clear out the dust and cobwebs, by forgiveing, by placing aside my pride and forgiving. I have to learn to humble myself and forgive thouse who have hurt me and learn to forgive myself. This is going to be a long process, one that I am sure I will fail at several times, but than again there is a lot of dust the clear away ans the cobwebs can tangel me up. But with the grace of God and the prayers of others, I know I can do it.